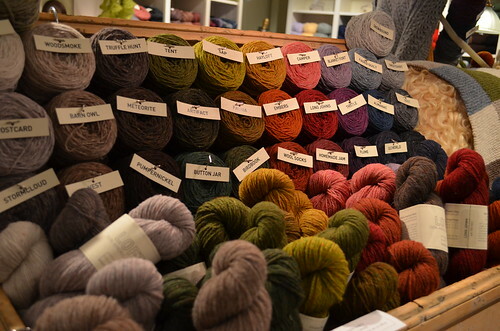 My local knitting group has a tradition of visiting the oh-so-chic yarn shop Churchmouse Yarns & Teas every spring. We’re on the Seattle “mainland” and Churchmouse is on Bainbridge Island, so it makes for a fun day trip because we get to ride the ferry over—it’s about a 30 minute ride, just long enough to get some good knitting done and enjoy the views. When I moved to Seattle someone told me that the ferry to Bainbridge is the best cheap date in Seattle—you can take it out at dusk, take some wine and cheese, sit out on the deck and watch the Seattle skyline recede, then turn around and take it right back, for only $7. But I digress. 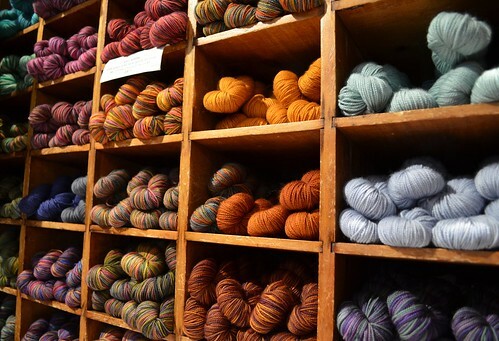 If you’re not familiar with Churchmouse Yarns & Teas, one of the things I love about it is their brand: everything Churchmouse is clean, simple, and stylish. And I mean everything—their logo, their website, their store layout, their pattern templates, and the patterns themselves, like this loop shawl or this poncho (which everyone has been wearing lately. I saw a group of five women trooping around in matching ponchos at Madrona). They had a stockinette shawl in their window last week that was so gorgeous I felt I had to have the pattern, even though it was just a stockinette rectangle. It’s all simple, beautiful, and appeals to my love of orderliness. Koigu KPPPM — the Churchmouse linen stitch scarf in Koigu is a classic. Churchmouse has fabulous notions, including shawl pins and buttons handmade with vintage tie silks by local artists. 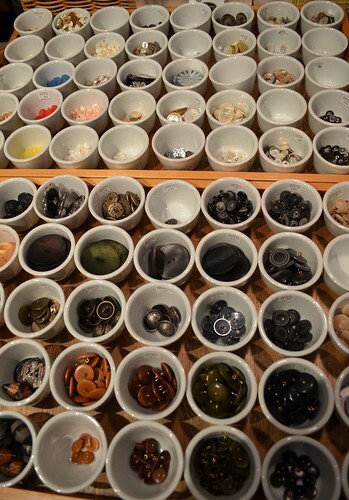 The buttons above are displayed in Japanese-style tea cups. After wandering Churchmouse for a couple hours we had lunch and then walked back to Mora Iced Creamery (just across the street from the yarn shop) for their killer artisan ice cream. Their crazy-flavor-of-the-week was something like saffron & marsala wine (!). 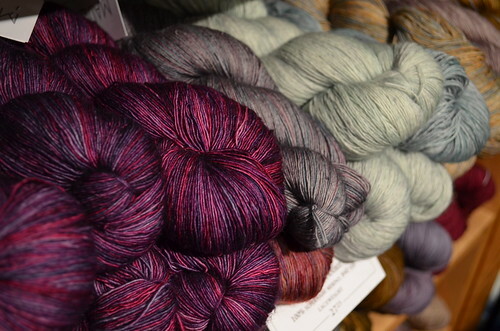 Then back on the ferry, where several folks were already casting on with their new yarn. We’re all obsessed with Veera Välimäki’s Color Affection shawl lately and one girl cast it on in a lovely orange, white and gray. 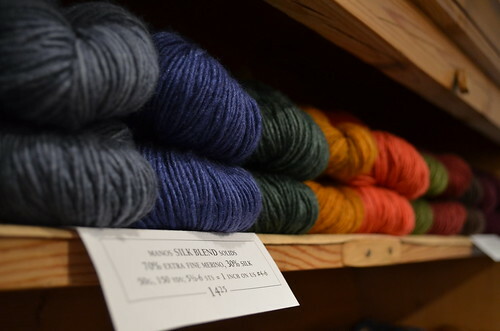 Churchmouse is also one of the few stores that carry Jared Flood’s Shelter (and now Loft) and BMFA yarns like Socks That Rock and Twisted. Here’s all the Shelter looking beautiful together. 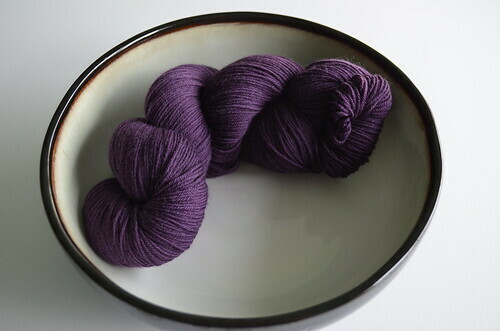 For my part, I’m pretty happy with my stash these days so I didn’t have a shopping list, but I did give in to this skein of Cascade Heritage which was exactly the same shade of purple as the dress I was wearing that day. I’m planning to pair it with a light gray and make Carina Spencer’s Catkin shawl.